Summer holidays should be about taking it easy – spending time outdoors, in the sun and crafting with kiddies! 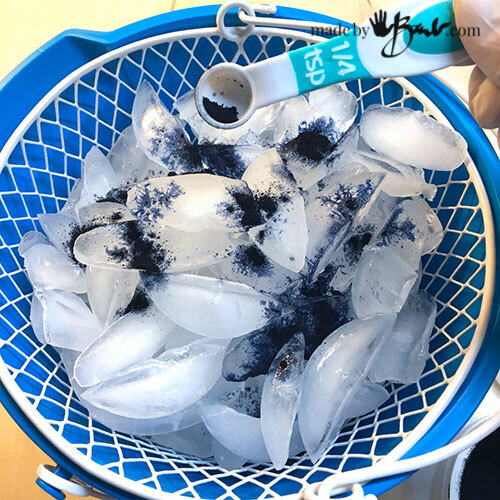 I love living in the blues of T-shirts and denim making this DIY Easy Dyeing with Ice a perfect summertime project. 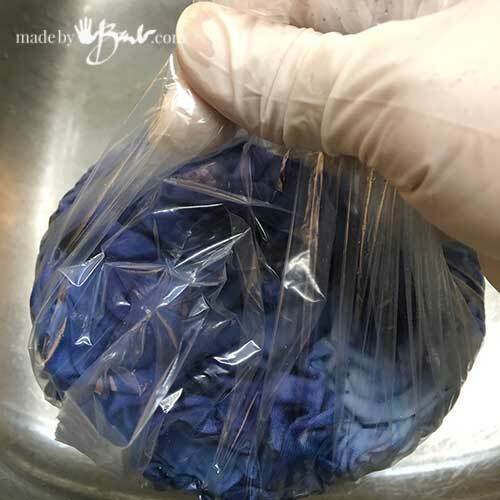 There are few things to know about using this type of dye. It will work on natural fibres such as cotton, hemp, cellulose, linen, viscose, rami, bamboo, wool, alpaca, and other animal derived material. 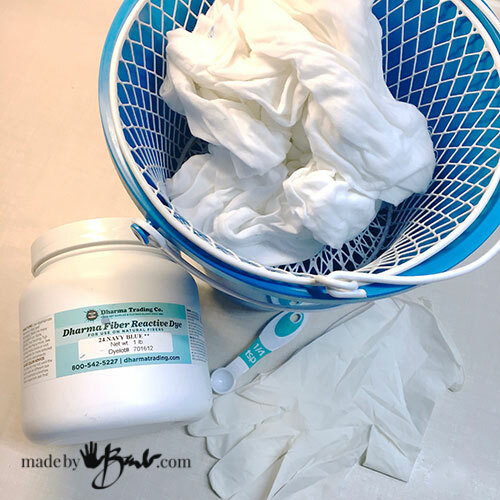 The most simple method here is using cotton knit as found in t-shirts. This dye is very concentrated! I’d guess that I used about 1 tablespoon to ice dye about 5 t-shirts. This dye reacts with the fibres and creates a strong ‘covalent’ (molecular) bond. That bond increases with the raising of PH and/or heat. As the PH increaser we use Soda Ash (calcium carbonate) which is also known as Washing Soda or Pool PH Increaser. Scrunch up the fabric well. Creating more folds will ensure more details and designs in the dye. For even more unique pattern you may tie off some some sections with elastics to create a tie-dye. Place it in the strainer over the catch vessel. 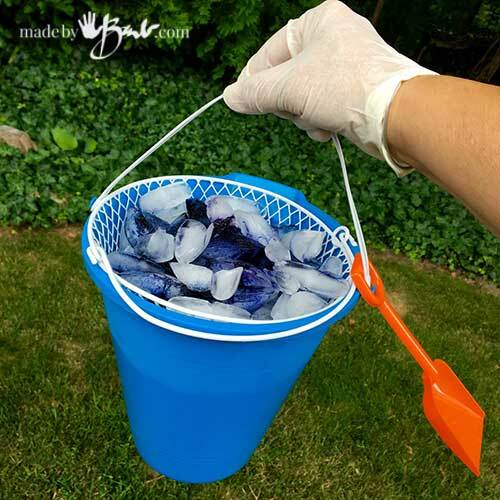 For the kids I used beach buckets and dollar store waste baskets which made carrying easier. Place some ice over the fabric. If you want a lot of colour you can completely cover the fabric or you can choose to have less by not covering it completely. 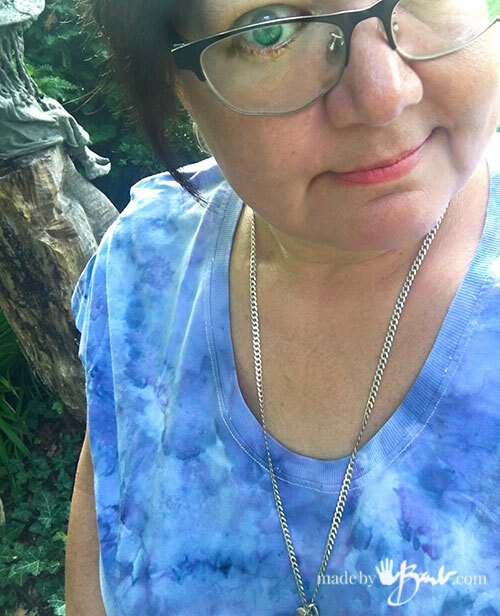 I’ve tried both and I like the more ‘airy’ look of partial dye. 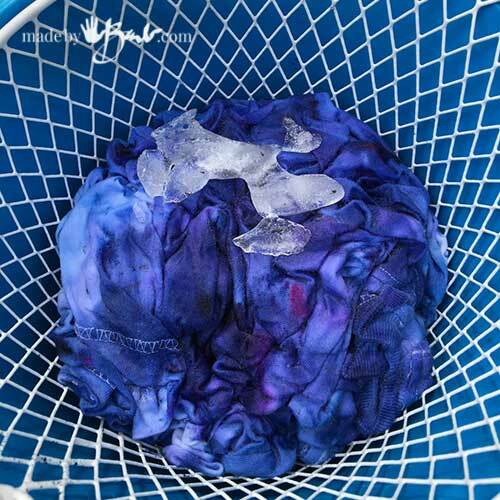 The ice dyes slowly and the water and dye find their own ways through the fabric. Various fabrics will give such different results. It is best to wear a dust mask to avoid any dye powder from being inhaled. For the children’s craft I placed a tiny amount of dye in miniature glass bottles to allow tiny sprinkling as this dye is very concentrated. Navy is a great colour as has many shades even when highly diluted. After a short time the ice was almost gone. This is going to be a very colourful shirt! Lots of ice and dye were used on this one. Dye some cotton socks as well. 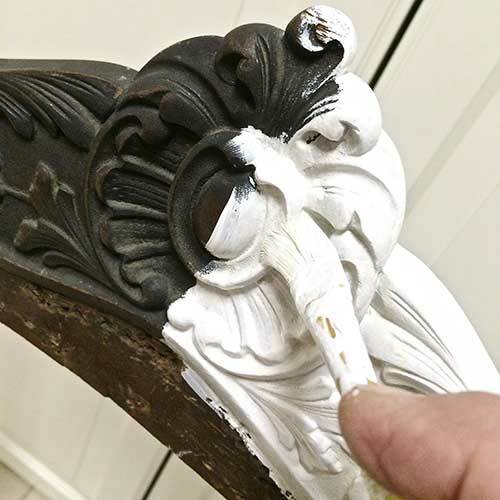 If using a variety of colours there will be more chance of colours mixing. Use the theory of colour mixing to determine what colours work best with each other. Otherwise you may make some muddy colours. I have used the navy many times in my shibori pillows and duvet cover and still love it! For some unknown reason (prob the colour mix) some lovely purples sneak out of the dye sometimes. Generally I tend to use some heat as a final assurance of setting the colour but it is not mandatory. You can just place the bundle in a garbage bag in the sun for a few hours as it will also heat up. Or you can transfer it to a plastic bag and microwave (dedicated) for a 1-2 minute warm. Once cool rinse in cool water until it runs clear. You may just let it sit for a day and not heat it. I have not had problems with losing colour. I believe the strong black colours need the extra heat setting. 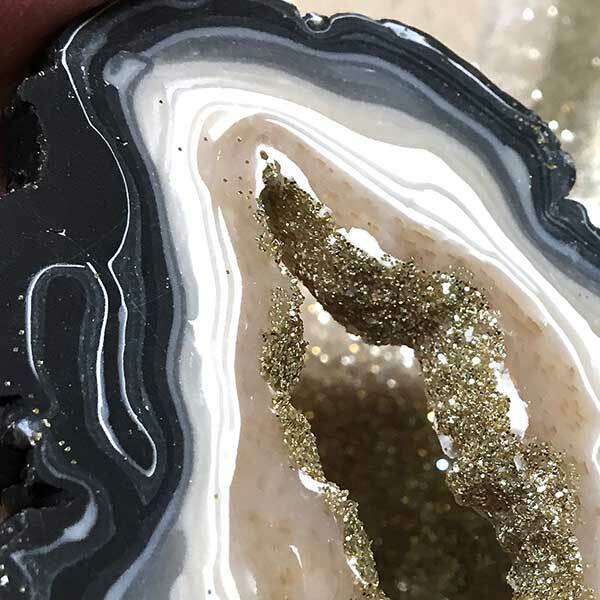 It is wonderful to see the unique patterns and designs that magically appear! That is why I love the blue, it’s wonderful at any tone! This one was not as completely covered in ice and dye. Cool Barb, I want to try this! You are such a fabulous teacher! Haha! 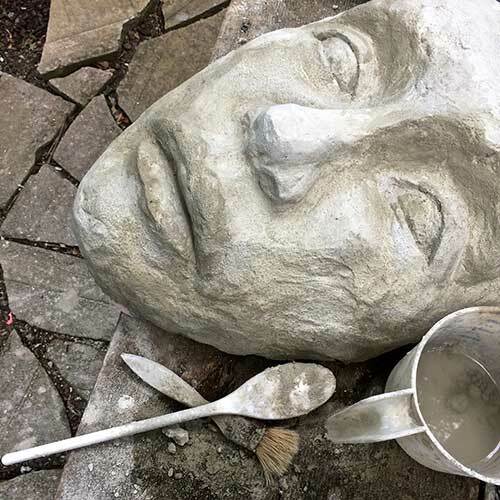 Fun to spread the creativity… Still more variations in my head! 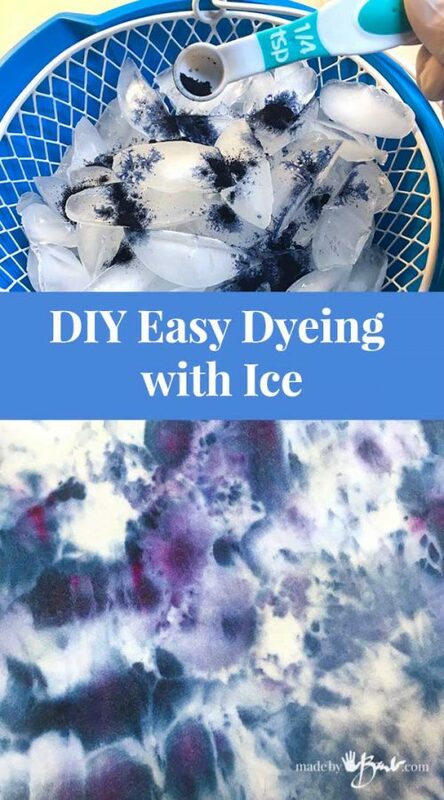 I was looking at the dye ice one and I was wondering do u show pics of them? For sure! See this post I am not sure why you don’t see them. 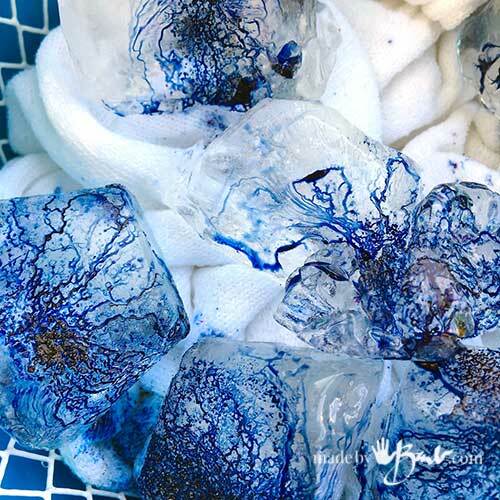 love this, just beautiful … i do a lot of dyeing, just love color therapy … but have not tried ice yet as I do not have an ice maker and small freezer … some people use snow but that won’t work for me here in Florida! Thank you, just lovely and excellent teaching as usual. 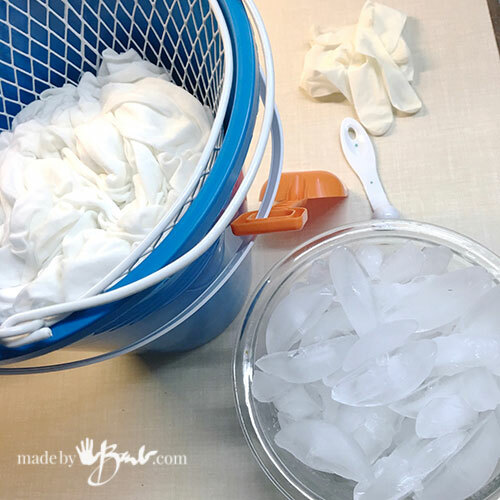 Have you tried other dyes with this ice method? I just purchased some cochineal (after being inspired by your cochineal eco printing tutorial) and was wondering about trying that? Oh, I don’t think the cold would help it adhere to the fabric. I’d save the precious cochineal for the eco printing. 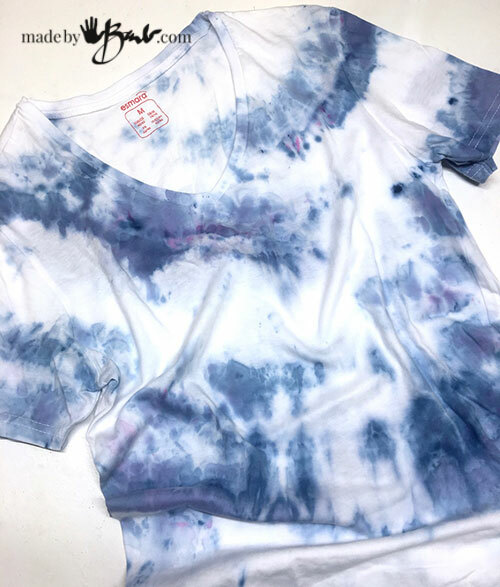 Fibre reactive dyes are quite economical and whole different thing. So much dyeing so little time! I started withe the fibre reactive due on the cotton in the shibori style. I have also applied it to silk and it is also amazing. Since silk is also a protein fibre like wool it is the same way by soaking in a vinegar solution before dyeing. 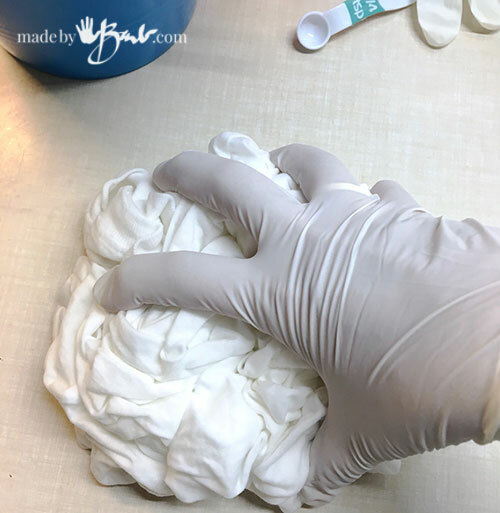 Cotton uses sodium carbonate as a prep. 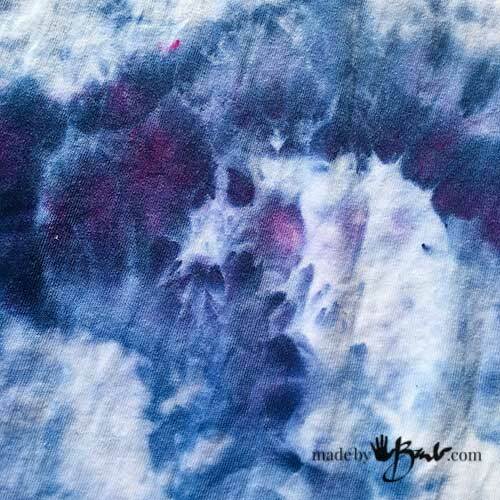 See here for the methods of dyeing shibori style which can be applied to silk.